X-rays are used in many diagnostic scans including CT imaging, mammograms and standard X-rays. An X-ray is a relatively high energy photon or light particle. We can see everything light touches and this type of light can pass through tissue, allowing us to see inside the human body. But exposure has to be limited because X-rays are ionising - meaning they cause atoms to acquire a positive or negative charge by losing or gaining electrons.Too much ionising radiation can damage the structure of cells. Find out more about radiation doses. MRI doesn't use this type of radiation. Instead, it uses magnets and radio frequencies which are completely harmless. The magnet used in MRI would be strong enough to pick up a car if it were used in a standard electromagnet (more than 1.5 Teslas), but MRI uses the magnetic field in a very different way. Hydrogen is the most abundant element in the universe. There are two hydrogen atoms in every water molecule and water makes up around 70% of your body. Hydrogen has a single positively-charged proton as its nucleus. These protons have what's known as a 'magnetic moment' - basically a north and south pole and a tendency to spin on an axis, just like the Earth. The magnetic field generated by an MRI scan causes these protons to line up and spin at a particular frequency. A secondary magnet turns the molecules to face new directions and when it's switched off they realign. The rate at which they realign depends on the type of tissue the molecule resides in. The radio frequencies are detected by coils placed over your body, and this information allows a computer to visualise everything from soft tissue to bone and organs like the heart and brain. The process has no known side effects. Why are MRI scanners noisy? 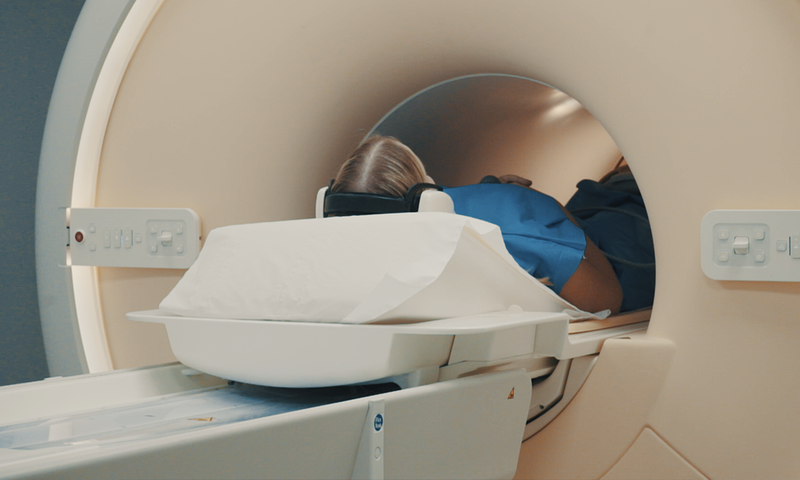 The noise of an MRI scanner is caused by running an electrical current through a coiled wire to create the magnetic field. When switched on, the energy forces the coil outward, it contracts when the magnet is switched off. During a scan, currents are switched on and off rapidly to measure the changes in the proton spins. This creates a series of loud clicks. Why do I have to lie still and hold my breath? MRI scans measure tiny sub-atomic movements in your body. For the scan to be accurate, all movement not caused by the magnetic field needs to be kept to a minimum. During some scans you may be asked to hold your breath for a short period of time. This ensures the most accurate scan possible. 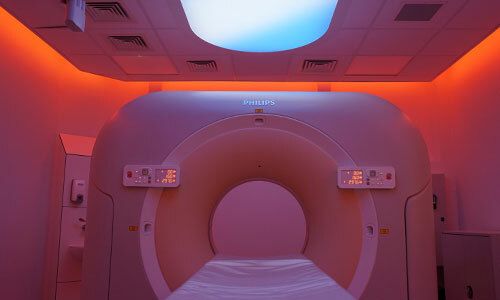 If you're worried about an upcoming scan, read 6 ways to keep calm during your MRI scan.